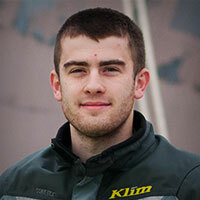 As odd as it may sound, February is a very exciting month for motorcyclists. I’m not talking about Valentine’s day, or the end of a long dark winter; I’m talking about new product launch season, and this time, Alpinestars is joining the party. For 2016, Alpinestars has released the Devon Leather Jacket & the GP Pro. There are plenty of technical details to review, so let’s dive right into the nitty-gritty. We’ll start where Astars expects most new customers will; with the Alpinestars Devon Leather Jacket. This is taking the place of the outgoing TZ1 as the my-first-leather-jacket offering. The big changes over the TZ1 are all in the details, with the Devon using Alpinestars’ current generation of Bio Armor in the shoulders and elbows, and incorporating a snap system for a new Nucleon back protector. The Devon also comes with chest armor pockets, a removable thermal liner, and a fully mesh lined interior under that. For comfort, the cuffs and collar are neoprene-lined, and there is a simple mandarin collar with no snaps to dig into your neck on a sport bike. Working from the inside out, the leather used here is a soft 1.1 mm cowhide, with accordion stretch panels at the elbows, and stretch textile on the inside of the arms and shoulders for mobility and flexibility. Alpinestars really toned down the shouty graphics for this jacket, and relaxed the fit for a more American-style, straight-side cut to this jacket. 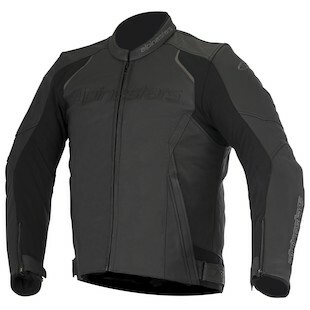 The Devon jacket will also be available in a perf version with the Alpinestars Devon Airflow Jacket. Moving on up the food chain, the Alpinestars GP Pro Jacket gets a refresh for 2016 after just two years on the market - a pretty short lifespan for a jacket. That said, a lot of jacket innovations came out over the last few years, and the GP Pro makes the best use of this. The biggest safety-conscious change is the introduction of larger leather panels and DFS in the shoulders. Larger leather panels - in this case 1.3 mm thick cowhide too - allow for fewer seams, and Dynamic Friction Shields (DFS) up the protection level even higher by taking existing seams and moving them under hard plastic sliders. 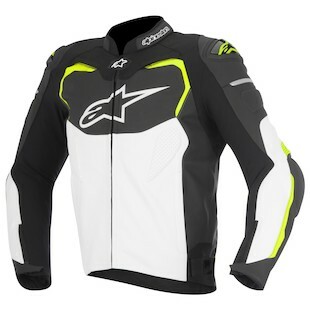 This allows Alpinestars to cover the notorious shoulder seam with a slider, making the jacket safer, while still allowing for plenty of range of motion. On that note, the new GP Pro jacket now has stretch material that runs up the inside of the shoulder, and up over the top as well to help in really aggressive riding positions. Comfort wise, the collar and cuffs are lined with a perforated, high-airflow neoprene, and the back of the jacket is lined with a 3D bubble mesh to keep your back dry. There are pockets for Nucleon chest and back armor, and the GP Pro comes with CE armor in the shoulders and elbows. As with the Devon Airflow, the Alpinestars GP Pro Airflow Jacket is also available for riders who are in search of a bit more ventilation. All in all, we’re happy to see what Alpinestars has done with their leather jackets moving into 2016. With additions such as the Devon and the Alpinestars Devon Airflow Jacket, the Astars lineup is looking more robust than ever!